Lake Success, N.Y., April 1, 2013 - Canon U.S.A., Inc., a leader in digital imaging, today introduced a revolutionary new camera that finally addresses the needs of left-handed photographers worldwide: the Canon EOS 7D L Digital SLR camera. Based on the highly successful EOS 7D, the EOS 7D L features a reversed ergonomic design which left-handed photographers will fall in love with. Whether it's shooting at eight frames per second (fps), focusing with Zone AF mode or recording 24p Full HD video, the EOS 7D L DSLR camera satisfies the most rigorous professional requirements with durability, flexibility, customizable controls and impressive image quality. To support production of the EOS 7D L, state-of-the-art manufacturing lines developed for the classic EOS 7D were reproduced in mirrored orientation. “Canon has been a world leader in innovation for over 65 years - and the EOS 7D L is another innovative product that we are proud to have associated with that heritage,” says Yuchira Izukio, executive vice president, CMOS Imaging Development, Canon U.S.A. 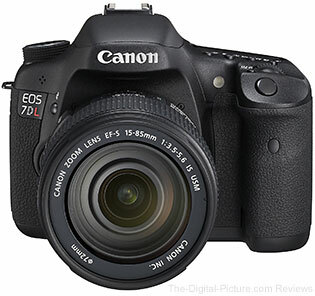 The Canon EOS 7D L Digital SLR camera is scheduled to be delivered to U.S. dealers at the end of May, and will be sold in a body-only configuration at an estimated retail price of $1,499.00*. It will also be offered in a kit version with Canon's EF-S 15-85mm f/3.5-5.6 IS USM zoom lens at an estimated retail price of $1,769.00*.